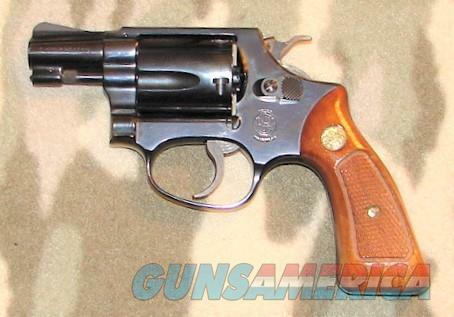 Description: Smith & Wesson Model 36 #8J8178 .38 Spl. 2” bbl. with an excellent bore. This pinned Chief Special retains all of its original finish showing only very slight muzzle wear on the left side of the bbl, a small faint scratch on the right side of the frame near the rear of the cylinder and the faintest of drag lines around the cylinder. The wood stocks are likewise in excellent condition showing some very minor scuffing on the bottom of the right stock. Timing is as good as it was when it left the factory over 35 years ago. This revolver shows little if any use at all and has the appearance of most likely never been fired since it left the factory. complete with box, tools and paapers.